Inaugurated on 14 April, 2019, our newest mandir is found outside, right next to the Shirdi Sai Baba mandir. Similar to its neighbour, this temple was lovingly created by Bhakti Marga Italy craftsmen and it sparkles with thousands of specialty tiles. Inside, you'll find Krishna in the form of Panduranga, and His wife, Rukmini, as they stand patiently waiting for the devotees, radiating compassion and Love. Feel the calm in the cave. A life-size activated murti of Mahavatar Babaji (the immortal yogi from the Himalayas) is your companion as you meditate, pray, do silent japa or simply listen to your heart. This deeply quiet sanctuary actually feels like a cave, with its cool dark interior and its ever-present energy of Babaji Himself. This is a real favourite of all our guests, so be sure to experience it for yourself. Here you'll find items from all over the world to serve the needs of those on the spiritual path. Built in 2016 with a technique known only to a few special craftsmen, this temple is a favourite place to go and spend a little time with the compassionate and approachable Shirdi Sai Baba. You are welcome to come and participate in the Shirdi Sai Baba arati, done every evening at 21:15h, and His abhishekam, done every Thursday evening at approximately 20:30h. Welcome to The Ashram! As you enter, Maha Lakshmi greets you with Her blessing. The Registration desk is to your left and the Welcome Desk is to your right. These are your best sources of information during your visit. The Registration Desk will help you with your room assignment, wi-fi connection, cash card and payments. The Welcome Desk's information board displays today's schedule, course and event details. During events, the Welcome Team is present and happy to answer your questions. The first deity to greet you as you arrive at The Ashram is Lord Hanuman, the Eternal Servant. 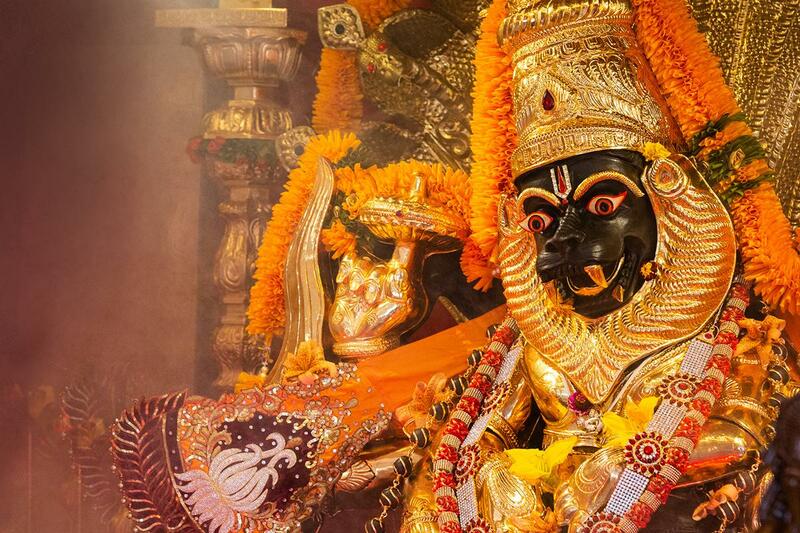 Ever devoted to Lord Rama, Hanuman, in the form of a monkey, is known for his strength, wisdom, humility and surrender. The Atelier is located on the far left of the Light Hall. The art created here is always done with the Divine first and foremost in mind and heart. Guruji says that 'painting is meditation' and you can really feel it in this very special room. Courses in Painting Meditation, Sri Yantra Drawing and Painting, Icon Painting, Intuitive Painting and Painting on Silk, are all held here, and you are welcome to sign up for courses anytime. The Shiva Lounge is a place away from the hustle and bustle of the rest of The Ashram. Located on the ground floor, you'll find it on your way to the Babaji Cave. Surrounded by Bhakti Marga art, you can sit, read, or meditate, or there are two computers here to help you connect online if needed. Sitting serenely on the front lawn of The Ashram is our Hari Poorna Bhakta Shiva. Considered the greatest devotee of Lord Narayana, Lord Shiva is an example of single-pointed focus on God, as He meditates without becoming distracted. Located just as you drive in to The Ashram, in a little wooden temple of Her own, lives Divine Mother in the form of Maha Kali. Although at first She may appear to be fierce and frightening, She is actually very sweet to Her bhaktas. She protects and purifies everyone who comes to Her. You are welcome to come and participate in the Maha Kali Arati, done every evening at 21:00h. Want to see what else you can do here?